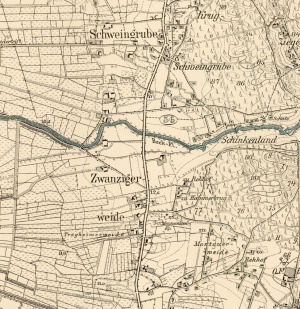 Detailed map of Tragheimerweide, 1913. Source: Buczkowski, Paul. "Z biegiem Wisły" website. Tragheimerweide (also known as Paswiska Tragenhaynanie and Tragheimerweyde; now known as Barcice; coordinates: 53.85651, 18.93676 [53° 51′ 23″ N, 18° 56′ 12″ E]; population in 1939, 466; in 2012, 330), lies 13.8 km (8.6 mi.) north of Kwidzyn (Marienwerder), 21 km (13.1 mi.) south south-west of Malbork (Marienburg), and 59 km (37 mi.) south of the regional capital Gdańsk (Danzig). 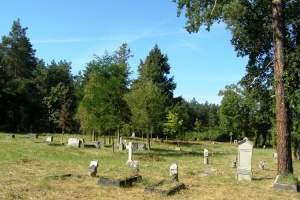 Tragheimerweide was a former Mennonite congregation and settlement in West Prussia, located between Marienburg (now Malbork, Poland) and Marienwerder (now Kwidzyn, Poland), immediately to the south of Zwanzigerweide. The First Partition of Poland in 1772 resulted in the creation of a new province in 1773, called West Prussia, in which Tragheimerweide was located. Tragheimerweide was situated in the district (Kreis) of Stuhm until the end of World War I, when it came under the jurisdiction of the German province of East Prussia. In 1928 the villages of Tragheimerweide, Zwanzigerweide, and Schweingrube were combined into one political unit. The village came under the control of Nazi Germany during World War II until February 1945, when it was occupied by Soviet forces and returned to Poland. 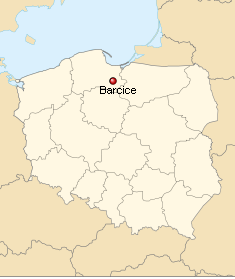 In 2012 Tragherimerweide (now Barcice) was a village in the administrative district of Gmina Ryjewo, within Kwidzyn County, Pomeranian Voivodeship. The last great settlement of Mennonites in West Prussia was made in the Stuhm marshes in 1724. The land was chiefly meadow, which the Mennonites now began to cultivate and on which they lived on their scattered individual farms, with cattle and provisions under one roof with the residence. The occasion for the settlement of these marshes was the return of the Mennonites from Lithuania, who had lived there since 1713, but had to leave the Memel Lowlands in 1724 on account of military service. On 10 November 1724 representatives of the Grosswerder sold two-thirds of Tragheimerweide to Salomon Becher and Jacob Jantzen for 2,200 Prussian guilders for the refugees. In the same year 14 hides of Rudnerweide were transferred to Mennonites coming from the Tilsit marshes who were trying to evade Friedrich Wilhelm’s recruiters for the “regiment of giants.” Other meadow lands (Schweingrube, Zwanzigerweide, Montauerweide, Zieglershuben, Klein-Schardau, and Gross-Schardau) were sold to Mennonites in these years, with the result that in the second quarter of the 18th century a closed Mennonite settlement came into being. The settlers for the most part came from the Montau and Schönsee congregations. In 1728 the Bishop of Culm permitted them to build a meetinghouse. This chapel was enlarged in 1763 and a cemetery laid out. Whereas this church was built in the style of Mennonite frame churches, the new church, built in 1866 on the site of the old one, was built on a Gothic plan in brick. In 1892 the church acquired a good organ. From 1762 the congregation kept records. The young congregation, belonging to the Frisian branch (called Waterlander in the Dutch Naamlijst) and called the Stuhm Lowlands congregation or Schweingrube (Stuumsche Needering op Swijngrube), went through a severe crisis in its first years (1733-1779). When the Frisian congregations in West Prussia at that time wanted to abolish marriages with Catholics and Lutherans, three members of Tragheimerweide living at Rosenkranz set up violent opposition, and with their followers proceeded to choose their own ministers. A conference of Frisian elders meeting at Schweingrube in 1779 prevented a schism. The Rosenkranz group won; mixed marriages were again tolerated in all the Frisian congregations. The village of Tragheimerweide in 1744 was exclusively Mennonite; by 1772, when less farm lands were obtainable, a number of Mennonites earned their living as weavers. This shortage of farm lands also caused a considerable emigration to South Russia in the early 19th century. The Prussian census of 1776 lists 24 Mennonite families in Tragheimerweide with the following surnames: Abraham, Aderjahn, Albrecht, Bestvader, Biltzer, Dircksen, Erbrecht, Esau, Flemming, Goertz, Harm, Jantz, Jantzen, Knels, Konert, Unger, and Unrau. In 1824 there were 14 Mennonite families listed in the land census of the Marienwerder district. The congregation had two subsidiaries—Marienwerder and Zandersfelde. About 1820 the old name of the congregation, Stuumsche Needering, was gradually replaced by "Tragheimerweide." In 1892-1929 it was called Zwanzigerweide because in 1892 the villages of Tragheimerweide and Zwanzigerweide were merged under the name of the latter; in 1929 the name Tragheimerweide was resumed, when for the purposes of incorporation it was necessary to define the geographic limits of the congregation. In 1807-1808 the Tragheimerweide congregation suffered losses by the immigration of several families to South Russia. In 1852 it had a baptized membership of 336; in 1888, 357; 1928, 550 souls; in 1940, 510 souls. The members, mostly farmers, were scattered over 27 villages and two towns in the areas of Stuhm, Marienwerder, and Mewe. It was served by an elder and five preachers and was a member of the Conference of the Mennonites of East and West Prussia. In 1945, as a result of the flight and expulsion of the Germans from this area, the congregation came to an end. The last elder was Albert Bartel of Unterberg near Rehhof, who served from 1940 to 1945. In 1958 Bartel was the elder of the refugee congregation at Bremen, but lived at Espelkamp. Ewert, Benjamin. "Geschichtliches aus der Mennonitengemeinde Heubuden-Marienburg." Mennonitischer Gemeinde-Kalender (1940): 48 ff. "Familienforschung in Westpreußen." Hans-Jürgen Wolf. Web. 29 September 2012. http://www.westpreussen.de/cms/ct/ortsverzeichnis/details.php?ID=6548. Hege, Christian and Christian Neff. Mennonitisches Lexikon, 4 vols. Frankfurt & Weierhof: Hege; Karlsruhe: Schneider, 1913-1967: v. IV, 348-349. Namensverzeichnis der Aeltesten, Lehrer und Diakonen oder Versteher der Taufgesinnten Mennonitischen Gemeinden in Ost- und West-Preussen, Litthauen, Polen und den neu angesiedelten Kolonien in Russland. Elbing, 1843: 23. Namens-Verzeichniss der in Deutschland, Ost- und Westpreussen, Galizien, Polen und Russland befindlichen Mennoniten-Gemeinden : sowie ihrer Aeltesten, Lehrer und Vorsteher. Danzig : [Westpreussische Mennoniten-Gemeinde], 1857: 14. Mannhardt, H. G. Jahrbuch der Mennoniten-Gemeinden in Ost- und Westpreussen (1882): 17, 19. Mannhardt, H. G. Jahrbuch der altevangelischen Taufgesinnten oder Mennoniten. (1888): 14. Schapansky, Henry. Mennonite Migrations (and the Old Colony, Russia). New Westminster, BC: Henry Schapansky, 2006: 135. Stowarzyszenie Konserwatorów Zabytków. "Barcice." Catalogue of Monuments of Dutch Colonization in Poland. 2005. Web. 9 September 2014. http://holland.org.pl/art.php?kat=obiekt&id=504&lang=en. Wiebe, Herbert. Das Siedlungswerk niederländischer Mennoniten im Weichseltal zwischen Fordon und Weissenberg bis zum Ausgang der 18. Jahrhunderts. Marburg a.d. Lahn : J.G. Herder-Institut, 1952: 40, 42, 85. Penner, Horst and Nanne van der Zijpp. "Tragheimerweide (Pomeranian Voivodeship, Poland)." Global Anabaptist Mennonite Encyclopedia Online. April 2013. Web. 18 Apr 2019. http://gameo.org/index.php?title=Tragheimerweide_(Pomeranian_Voivodeship,_Poland)&oldid=146296. Penner, Horst and Nanne van der Zijpp. (April 2013). Tragheimerweide (Pomeranian Voivodeship, Poland). Global Anabaptist Mennonite Encyclopedia Online. Retrieved 18 April 2019, from http://gameo.org/index.php?title=Tragheimerweide_(Pomeranian_Voivodeship,_Poland)&oldid=146296. Adapted by permission of Herald Press, Harrisonburg, Virginia, from Mennonite Encyclopedia, Vol. 4, pp. 741-742. All rights reserved. This page was last modified on 16 January 2017, at 07:00.